Even coming in at a whopping $130.9 billion in Q3 2018, US eCommerce revenues are less than 10% of the $1.34 trillion total retail revenues during the same quarter, according to the US Department of Commerce’s latest Quartley eCommerce Retail Sales Report. Thus, it’s understandable that while Amazon (the retailer and the marketplace) accounts for nearly 50% of all US eCommerce revenues, it only accounts for 5% of all retail revenues. These stats point to the fact that there is still a lot of room for eCommerce sellers to gain a bigger share of the enormous retail pie. While physical retail clearly isn’t dead, to get ahead, online sellers need to pay attention to advances in technology and changes in consumer behavior. Those sellers that ignore the trends or wait too long to jump on board will be left behind. There’s no shortage of examples of retailers who have failed to adapt rapidly enough and suffered the consequences. ToysRUS, Sears, Kmart, Abercrombie & Fitch, Claire’s, and The Gap have either closed many stores, gone bankrupt or closed altogether during 2018, and the list goes on. 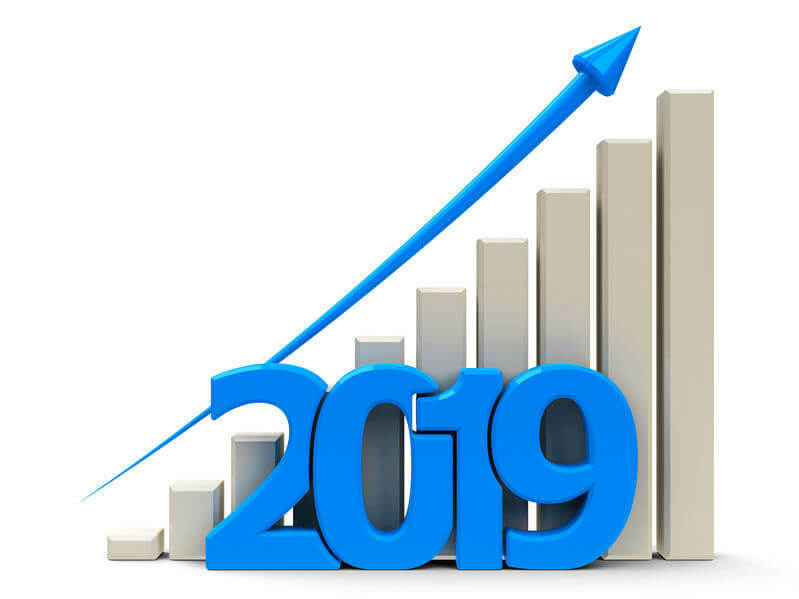 Paying attention to and taking action to support the following 5 eCommerce trends will help sellers not only survive, but also maximize their eCommerce revenues in 2019 and beyond. Voice Commerce is set to become a disruptive force in 2019 with more and more consumers taking advantage of this intuitive technology. Voice search is used not only by owners of smart speakers like Amazon Alexa and Google Home, but also by people searching from their mobile phones, laptops, and desktops. Voice search and voice shopping are definitely happening. Walker Sands’ The Future of Retail 2018 Report showed that 50% of those that owned a voice-controlled device made at lease one voice-controlled purchase during the year. According to OC&C Strategy Consultants Study, voice shopping is set to skyrocket from $2 billion in 2018 to $40 billion by 2022. People speak differently than they write, so queries are different – typically longer and more natural speech. This means that online sellers need to optimize their metadata and content to match the context and intent of the query. Detailed listings and Q&As can also help. Typically, voice search provides just one result. This means that the users won’t have the opportunity to scroll through 5 pages of results, not to mention the top 3 or top 10. While it may leave many products out, you must admit that it makes sense because people are using voice search for the convenience and speed. Therefore, it’s critically important for online sellers to optimize their listings, ads, and websites for voice search. If you are not number one, you probably won’t have another chance to make the sale. There’s a lot of advice out there about how to technically optimize your website and listings for voice. It’s a good idea if you review these articles and consult with experts to make necessary adjustments, sooner rather than later. When discussing voice search for eCommerce, Amazon Alexa deserves its own section. Amazon Alexa holds more than 50% of the home speaker market today. According to OC&C, 85% of consumers select the products that Amazon suggests. This is only going to become more significant as consumer adoption increases. So, if you’re not participating in the Amazon Alexa program, you could be missing a valuable opportunity. At the very least, serious sellers should start investigating it now. With seemingly less control over political and environmental decisions, consumers are putting their dollars where their values are. Today’s shoppers are more aware of the huge islands of plastic in our oceans, global warming, and the inhumane treatment of animals. As a result, they are taking a stand by buying recycled and reusable items, from company’s with sustainability policies, and shopping for vegan products and from companies that don’t do animal testing. According to a 2018 survey on US consumer behavior reported by Statistica, 87 percent of respondents said that they would purchase a product because a company advocated for an issue they cared about. An equal number said they would purchase products with social or environmental benefits. And it’s not just consumers. It’s employees too. Employees are demanding that employers stand up for ethical issues, whether it is equal opportunities and equal pay for all or data privacy and security. Retailers are feeling the pressure and are jumping on this bandwagon. In 2017, the largest turkey producer in the US, Butterball, introduced its first organic free-range turkey. IKEA has pledged to use only renewable and recycled materials in its products by 2030. Seeing the throwback against fast fashion, fashion retailer Gather & See enables its customers to filter its products by one of its five founding philosophies: fair trade, organic, eco-friendly, small scale production and heritage. Online retailers should take time to formulate policies on the current popular political, environmental and social issues. Just as important as staking their ground is publicizing their views and policies. It is indeed good marketing when you appeal to the right segments. However, if customers aren’t aware of a seller’s stance, it won’t help them gain revenues from this powerful segment. While you might have considered m-commerce as “nice to have” before, if sellers don’t provide an excellent mobile experience in 2019, they will lose sales. Consider that smartphones drove the majority (54.4%) of traffic to retail sites and more than one-third (36.7%) of the $3.7 billion US consumers spent on Thanksgiving 2018 according to Adobe. Adobe also reported that Cyber Monday mobile transactions increased 55.6% over the previous year, reaching $2.2 billion in sales and these mobile shoppers were using a variety of shipping options, like buy online and pick up in store. Even if shoppers don’t always buy on their mobiles, mobiles are clearly a significant part of the “blended retail” experience. It’s 2019, and online sellers can no longer afford to neglect consumers who are browsing, comparing and buying from their mobiles. Online sellers that give their mobile visitors a comfortable and convenient experience will reap rewards instead of meeting the Grim Reaper. According to an article in CMO magazine, two out of three shoppers (67%) say it’s important for brands to automatically adjust content based on their current context. And a similar number (66%), say that experiencing content that isn’t personalized, that is poorly designed or isn’t optimized for their device would stop them from making a purchase. Digital technology and artificial intelligence are making it easier to provide consumers with personalized buying experiences, but it is easier said than done. Retailers need to leverage data while not infringing on consumer privacy. Online sellers need to make sure that the data they use is clean and up-to-date and any third-party information has received their explicit consent. Bad data will provide bad experiences. If data is too personal it might spark distrust. Accenture’s 13th annual Strategy Global Consumer Pulse Research report found that 41% of consumers said they switched vendors because of “poor personalization and lack of trust.” How does this translate into numbers? Accenture calculated that retailers and brands lost $756 billion in the US and $2.5 trillion globally due to poor personalization experiences. Sellers need to consider personalizing the entire customer experience, from sending emails with targeted product offerings, to suggesting similar and related items, and much more. However, before investing in AI technologies, sellers should talk to their users and understand the types of personalization services they would find beneficial rather than implementing something quickly just to tick the box. And it’s even more important that sellers make sure their database has clean and up-to-date information. Visitors and customers won’t be happy to be on the receiving end of the Garbage In, Garbage Out phenomenon. There’s a lot at stake; sellers will find it worthwhile to invest their time to figure it out before they act. Collecting and storing personal data of consumers is a big responsibility, not to be taken lightly. Sellers also need to be aware of the data being collected by third-party services they are integrating with or running on their websites. Companies that don’t follow GDPR and other relevant policies and best practices are at risk for large financial penalties and lawsuits. In the end, consumers are more likely to buy from online sellers they trust and will avoid those they don’t. Provide transparency to your visitors and customers so they understand how their data is working for them. Playing games can be costly. We understand that online sellers are busy with daily tasks of product research, sourcing, marketing, order fulfillment, and more. But they have to think of the future as well as the day-to-day to stay in the game. It’s often hard to make time, but if you don’t make it a priority to adapt to upcoming trends, the future of your business is on the line. Algopix’s product research platform can help you save a lot of valuable time with selecting the right products to sell from your suppliers and knowing the best marketplaces to sell them on. If you invest the time you save on your product research into adapting to the future, you should be in good shape to continue selling and bringing in profits for a long time to come.